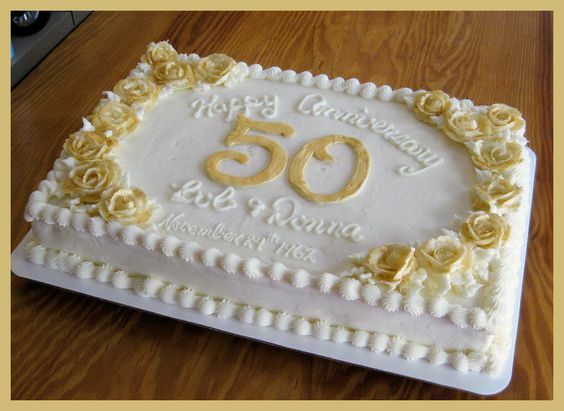 A 50th wedding anniversary is a great accomplishment and should be celebrated in style. Naturally, on such a special occasion the couple should be the centre of attention and the guests of the celebration should come prepared, bringing presents that reflect the many happy years of marriage. Sometimes, however, it might not be so easy to choose the right present, one that truly captures the warm memories of the couple and serves as a reminder of their life together. That’s why we’ve prepared so the ultimate list to make things easier. These marvellously intricate luxurious dinner sets are certain to impress any couple and make their dinners a lot more romantic. A great reminder of the day the couple met for the first time, perhaps even of the first kiss. The anniversary plate is a classic present that also looks stylish and serves as a decorative piece. 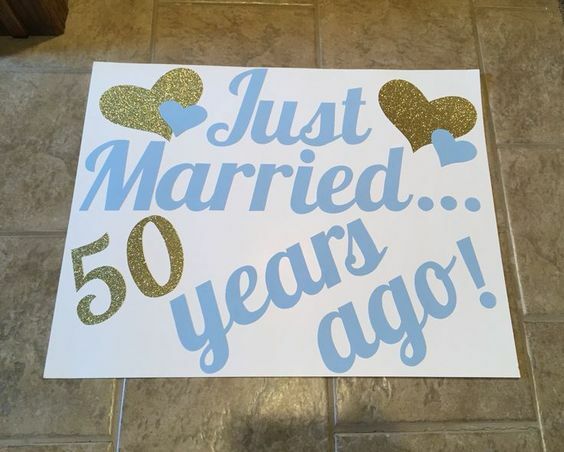 This is another great way to help the couple remember their special event and decorate their home at the same time. Is it the doorbell? No, it’s just this wind chime reminding of a great 50th wedding anniversary. In celebration of the youngest years of the couple as well as the present, marking the long road they`ve walked together. A collection of decorative pieces with inspiring quotes about the importance of love and family. 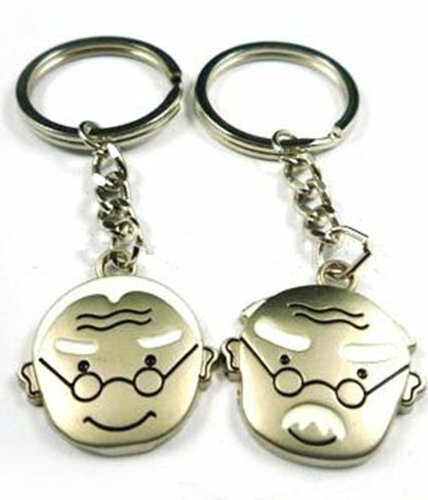 A great present for letting everyone around you know just how much you`re in synch with your significant other, it’s especially adorable on elders. 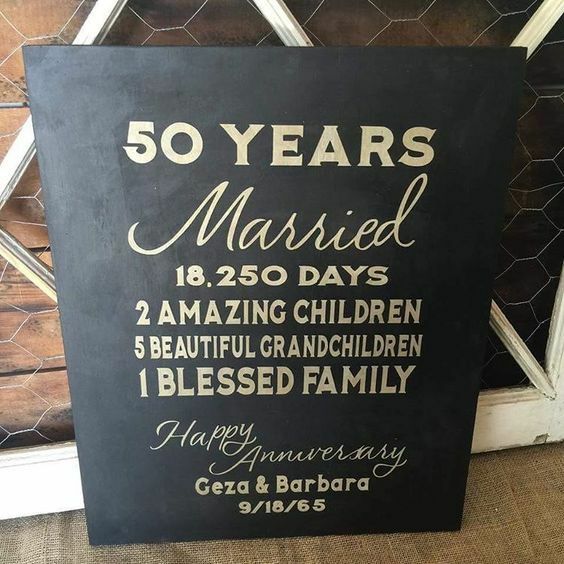 After 50 years of marriage it`s hard to keep track of every important moment, but with this canvas it`s all there. 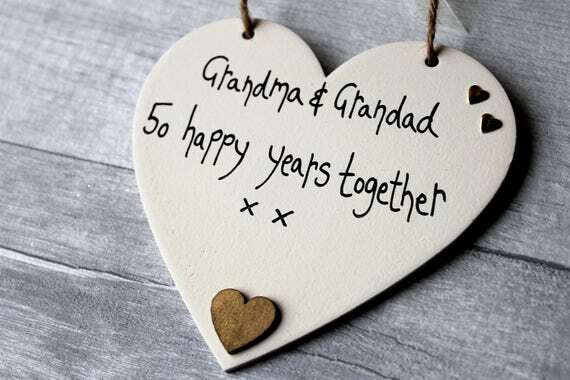 “True Love Never Grows Old”, the perfect message after 50 happy years of being together. So the couple can recreate the magic moment of their first wedding toast. Invite friends and family of that special couple to contribute letters online and turn them into a beautiful personalised anniversary book. A unique and personalized anniversary gift: From a Birdie memory book. Let FromABirdie gather letters of congratulations from your friends and family and create a beautifully bound collection for the two sweethearts to cherish forever. It`s stylish, original and simple, certain to make the couple smile. Don’t let the couple forget that they`ve managed to achieve the ending of every good fairytale. It`s a wonderful item for celebrating true love. These frames are a great way to feature photos of both the couple and their beloved children. It’s the one true ring to celebrate them all. Because a parent’s greatest love and joy are always their children. A throwback to when it all began. Help the couple welcome their guests while also letting them know how much they love each other. These mugs with a family tree print will warm the hearts of the elderly couple as they sip their tea together. The children of our children – grandparents always appreciate memorabilia related to their beloved little ones. 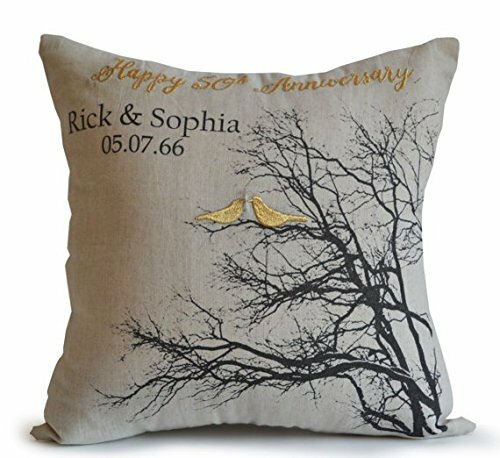 This stylish print will help the couple look back on a life well lived, full of meaningful memories. It`s not how long you live, but how well you’ve spent that time and being together with the person you love is the most worthwhile thing to do. 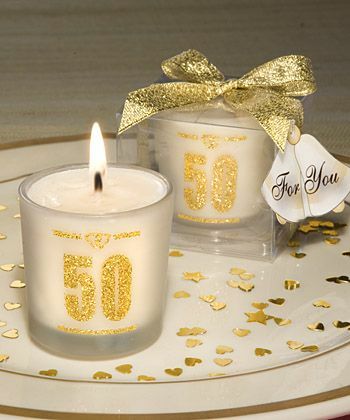 When the flame of love has been burning for 50 years, it’s time to celebrate. After all, family is the most important thing. Sometimes the best present is the simplest one. A sweet couple deserves a sweet cake. A chocolate piece of candy for each sweet year spent together. It`s perfect for holding some of the flowers after the celebration. If you are looking for a glass vase however, look no further than here! 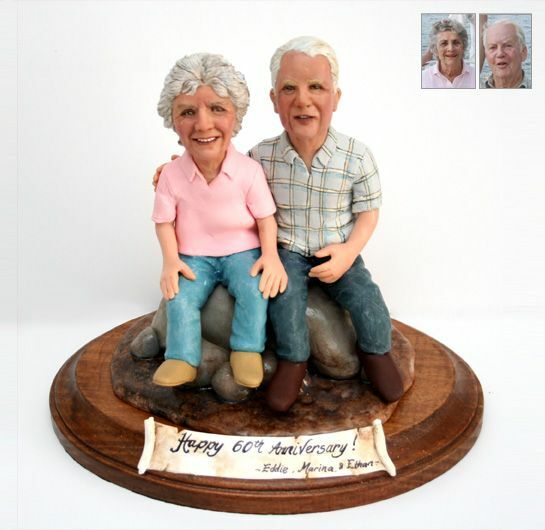 This is a present that is sure to stand out among the rest and warm the couple`s hearts. 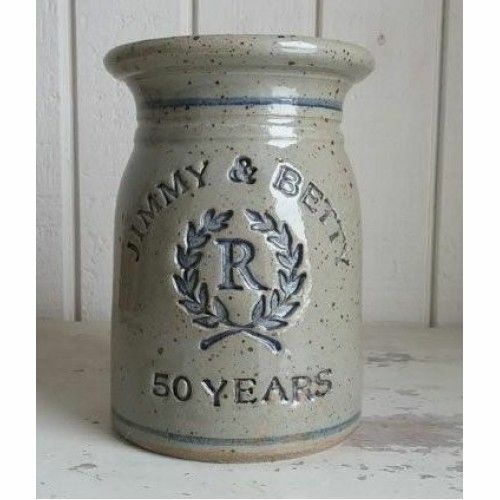 A great anniversary present for a couple that has a shared love for food. With two embroidered birds, chirping in sync just like the celebrating couple. 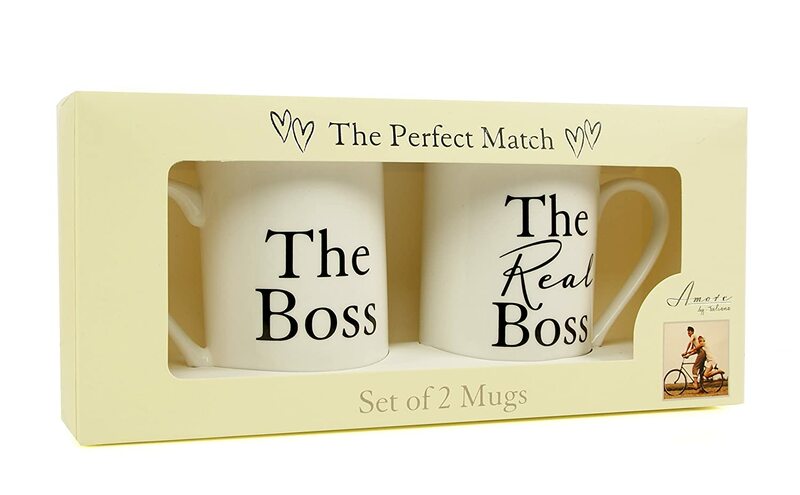 We all know who`s getting “the real boss” mug. It contains everything necessary for the couple to remember their picnics from when they were young and why not set on a new adventure? Help the couple delve into nostalgic memories from the year they got married. It probably feels like it was yesterday. 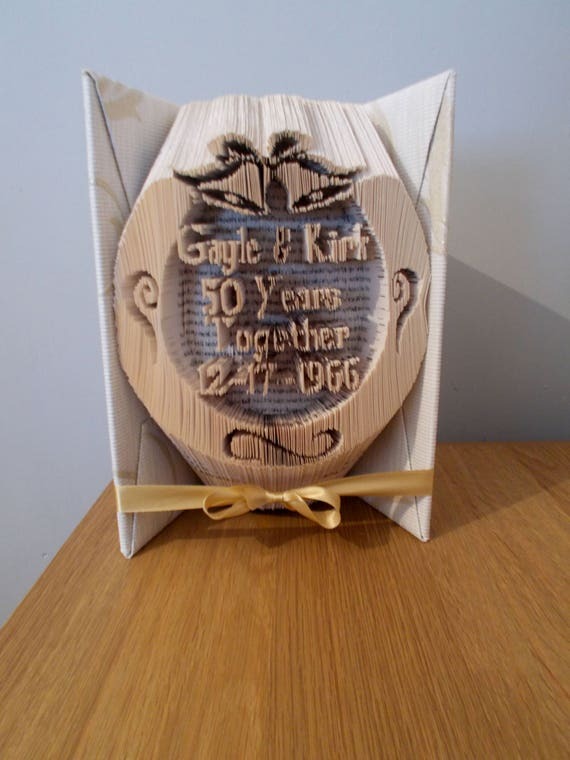 It`s a pricey but memorable gift for a really special occasion and couple. 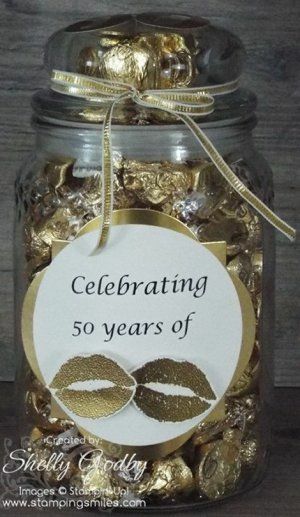 Shiny and sweet, perfect for a golden wedding anniversary. 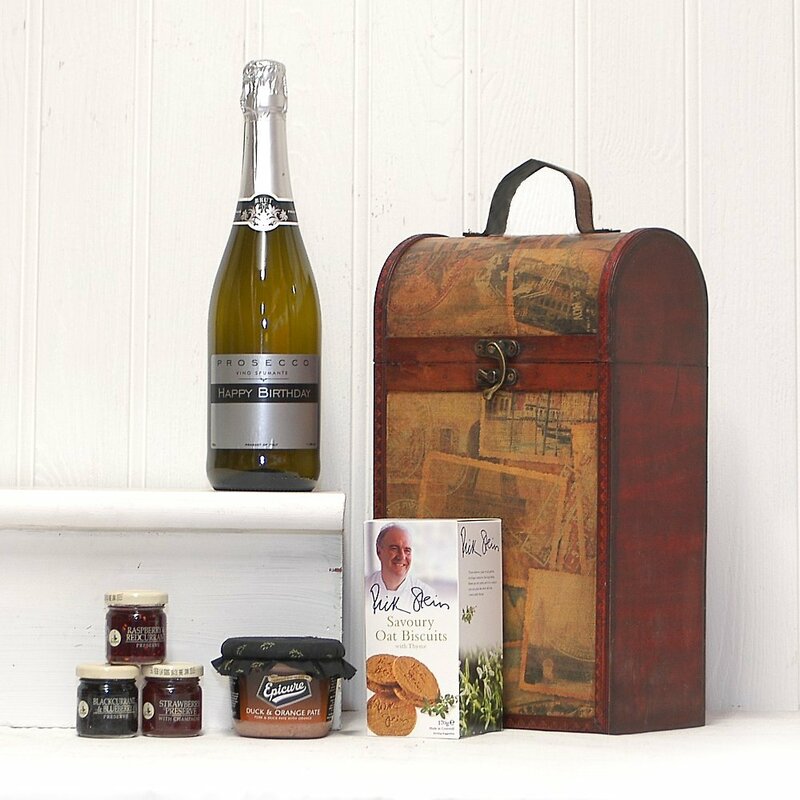 Gourmet food selection and tasty Prosecco along with a champagne bucket are the perfect mix for celebrating any occasion. If you want your present to be unique, this is the way to go. Plus, it might come in handy. For a couple that has a sense of humor and like laughing together. 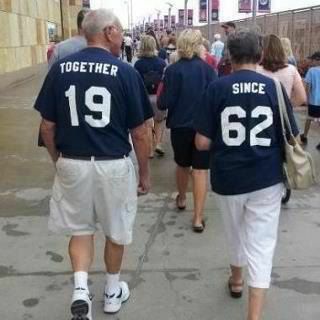 “50 happy years together” and continuing to count. Extremely unique and stylish, this book art will make anyone who opens it smile. It`s a nice reminder for the big day that happened 50 years ago. A special selection of chocolates, for a special occasion. Whiskey always tastes better when shared with a loved one. A perfect gift for all the tea lovers out there. Let the couple pop that champagne and celebrate. Add a set of unique champagne glasses as well! A showcase of all the important events that led to this glorious day of celebration. After all, a golden wedding celebration requires some gold. 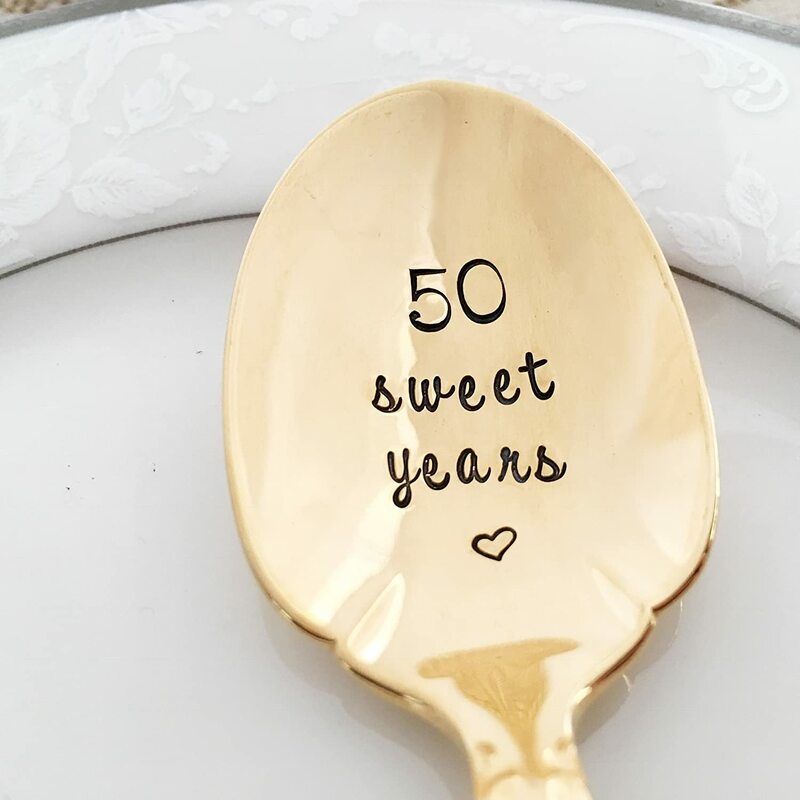 You now have the necessary information to shine at any 50th wedding anniversary celebration as the guest who had the perfect present. After that, it’s time for the fun part and enjoying the party. Were our suggestions helpful or is there anything you`d like to add to the list? We`d love to hear your opinions and ideas in the comments section. 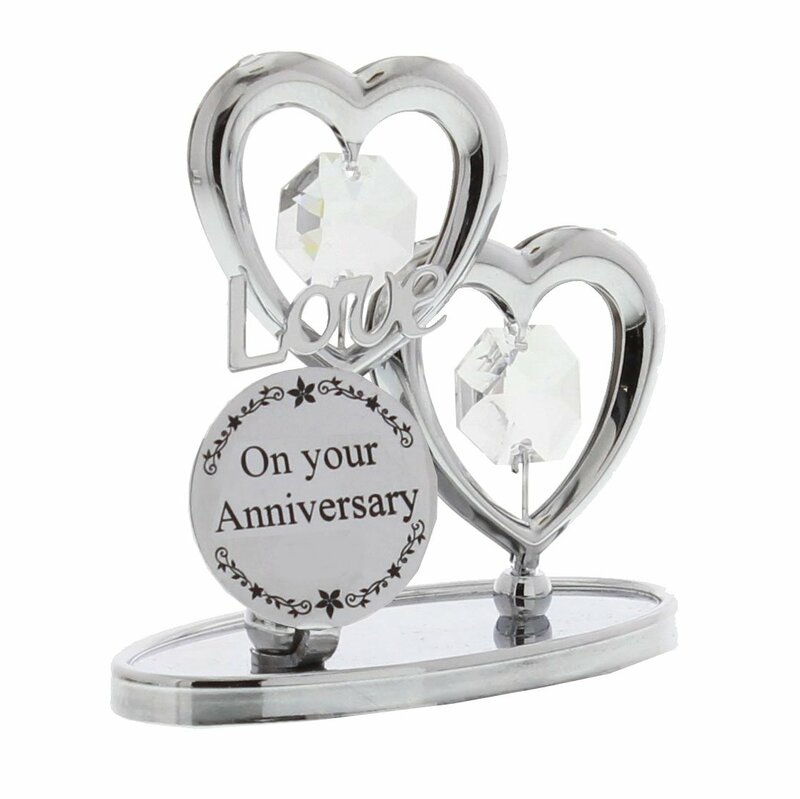 We invite you to browse through tons of Anniversary gifts ideas here. Continually updated lists to choose between traditional as well as contemporary anniversary themes.